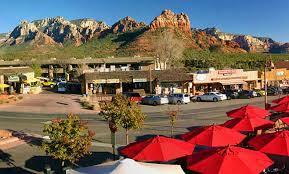 Come join us for a trip to Uptown Sedona! Enjoy the views as you walk, shop, dine, and explore for the day! Tickets include a full breakfast buffet provided by the Sunset Grill prior to departure and transportation to Uptown Sedona for the day. Walk, shop, dine, and explore this beautiful area until 3:00 p.m.
3:00 p.m. - Depart Sedona (please arrive 15 minutes before departure). The cost is $40 per person and includes a full breakfast buffet prior to leaving, snacks and beverages for the bus, and round trip bus transportation. Tickets available for SLHOA1 Residents ONLY February 11th. All others available to purchase February 12th - March 11th. Tickets also available at Administrative Services.